Don't worry. My reason hasn't gone all screwy during my absence. I don't really think that Senator John McCain (R-Ari), the now putative Republican nominee for the US Presidency, is the new Ronald Reagan. John McCain, who only 8 years ago failed to gain his Party's nomination, might just walk away with it all in 2008. The last person to do something similar was the self-same ex-Governor of California and Hollywood star. When he wasn't chosen as the nominee in 1976, Ronald Reagan's fortunes were on the way down. He was seen as too old, too conservative, too belligerent in 1976, especially given the moderate, humble personality of incumbent president, and fellow Republican, Gerald R. Ford. Fast forward 4 years, and those same characteristics gave people confidence not pause. Ronald Reagan won 50% of the vote, 9 percentage points ahead of President Carter. America, it seems, was ready for a little feistiness. Is the same true today? 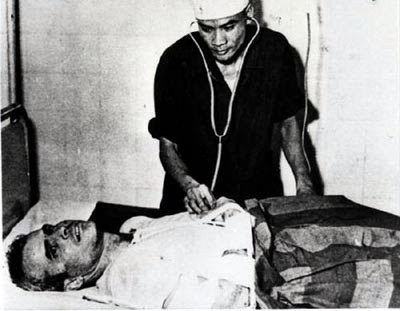 The man, John McCain, has not changed. Have the times changed? But I'm not sure they've changed entirely in the Senator's favour. The steady tiller of State he promises to be are at odds with his bull-in-the-Chinashop personality. This is the exact opposite of President Reagan, who extreme leftists believed would blow up the world with his stark anti-Soviet rhetoric, all the while being an extremely affable man. But it is true that Senator McCain has been given the chance to reinvent himself, just like the late President. It's an invaluable chance, given the oft-mentioned Fitzgeraldian phrase, "There are no second acts in American lives". Well, the one thing that Senator John McCain has proven in his life, is that he doesn't waste a chance to live again. "Wow, blogging is hard work. Kudos to Ann Althouse, Glenn Reynolds, The Anchoress, Michelle Malkin and all them who can keep it up, year after year, with pithy blogpost-titles!" Well, I think I know! They grab the Zeitgeist by the Albrights, and let loose all the cultural bullet points of the day. So there you have it above. Think I missed out on touching on anything really important, like say, RonPaulians buying up all the tinfoil hats? Ah well. Next post perhaps. As an aside, I love all of you who were and sometimes are, my daily readers -- not to mention those who I consider my friends. I just have a funny way of showing it, you know? January 13, 2008 also marks the 3rd anniversary of Sundries' fit-and-start life. I'm a proud mama.